Descriptive text is a text which says what a person or a thing is like. Its purpose is to describe and reveal a particular person, place or thing. Teks Deskriptif yaitu teks yang menjelaskan gambaran seseorang atau benda. Tujuannya adalah untuk menggambarkan atau mengungkapkan orang, tempat atau benda tertentu. Bisa dikatakan juga bahwa Descriptive text adalah teks yang menjelaskan tentang seperti apakah orang atau benda yang dideskripsikan, baik bentuknya, sifat-sifatnya, jumlahnya dan lain-lain. 1. Identification (identifikasi) adalah pendahuluan , berupa gambaran umum tentang suatu topik. 2.Description (deskripsi) adalah berisi ciri-ciri khusus yang dimiliki benda, tempat, atau orang yang dideskripsikan. - Hanya fokus pada satu objek tersebut. 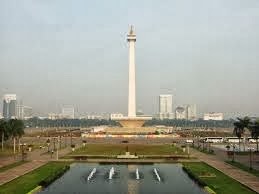 The National Monument (or Monument Nasional) is a 132 meters tower in the center of Merdeka Square, Central Jakarta. It symbolizes the fight for Indonesia’s independence. The monument consist of a 117,7 m obelisk on a 45 m square platform at a height of 17 m.
The towering monument symbolizes the philosophy of Lingga and Yoni. Lingga resembles, rice pestle (alu) and Yoni resembles a mortar rice (lesung), two important items in Indonesian agricultural tradition. The construction began in 1961 under the direction of President Soekarno and the monument was opened to the public in 1975. It is topped by a flame covered with gold foil. The monument and museum is opened daily from 08.00 – 15.00 every day throughout the week, except for the last Monday of the month the monument is closed. Prambanan is the largest Hindu temple compound in Central Java in Indonesia, located approximately 18 km east of Yogyakarta. It is characterised by its tall and pointed architecture, typical of Hindu temple architecture, and by the 47 m high central building inside a large complex of individual temples. It was built around 850 CE by either Rakai Pikatan, king of the second Mataram Dynasty, or Balitung Maha Sambu, during the Sanjaya Dynasty. Not long after its construction, the temple was abandoned and began to deteriorate. Reconstruction of the compound began in 1918. The main building was completed in around 1953. Demikian penjelasan mengenai Pengertian, Tujuan, Struktur, Ciri dan Contoh Descriptive Text.